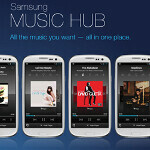 The Samsung Music Hub has made its way into the U.S. and the first device that will get the feature is the Samsung Galaxy S III. The Samsung Music Hub allows users to buy tunes from the Korean based manufacturer for a one time flat rate. You can select from millions of songs from Sony, EMI, Universal, and Warner and listen to previews of songs you are considering buying. Any songs purchased are sent to the cloud where they can be accessed by any device you own. For $9.99 per month, the premium version of the service lets you stream unlimited music from those four previously named major labels and use Scan and Match technology to get faster upload times and higher quality playbacks by moving some of your personal collection to the cloud. Up to 100GB of unmatched songs will be uploaded to the cloud. With the premium service, you will have access to 7digital’s entire Music Hub catalog, including music to stream or purchase, with unlimited plays and no advertisements. You can also create personal radio stations based on your favorite songs or you can listen to genre stations created by the Music Hub team. The premium service had previously been released in Europe with the launch of the Samsung Galaxy S III back in May. DALLAS (July 31, 2012) — Samsung Music Hub – the first completely integrated, all-in-one mobile music service – is now available in the U.S. on the Galaxy S® III. Music Hub simplifies and enhances the everyday experience of listening to music. The mobile music service provides a rich music experience for everyone whether users are an avid collectors wanting easy access to their own music collection, someone with ever-changing music tastes, who likes to sample a broad selection of music and genres or individuals who prefer radio. A free 30-day trial of the service will be extended to new Music Hub users in the U.S. New subscribers also will be able to choose a free album that will be instantly available on their Galaxy S III and can also be uploaded to their personal music collections on the internet. Based on the technology services of mSpot, a leading mobile content service provider recently acquired by Samsung, the new Music Hub service will initially be available on Samsung Galaxy S III devices sold through leading U.S. carriers. Galaxy S III users can access the application directly on select handsets and via the Samsung App Store or Google Play. More information on accessing Music Hub on select handsets can be found at: http://www.samsung.com/us/article/music-hub-all-the-music-you-want-all-in-one-place. This pairing with the Galaxy S III is ideal as the overall Music Hub experience has been optimized and specifically designed for mobile devices. Advanced streaming and downloading options let users save storage space, play music when offline, and cut down on mobile data usage. Audio settings are designed to prolong battery life and ensure smooth streaming even under spotty network coverage. The Music Hub service will be offered as both a free and premium version. Store purchased music in the cloud, allowing it to automatically load on all registered Music Hub devices, while still being available on those registered devices locally for offline listening. Use the Music Hub web player, in addition to the mobile app, with which users can access their music library and the Music Hub catalog/store online at www.musichub.com. A Scan & Match Cloud Locker: Upload music to the cloud to play it on any device registered with a Music Hub account. Music Hub also utilizes scan-and-match technology to decrease upload time and ensure high-quality playback. Any unmatched songs are directly uploaded from user’s library to the cloud offering 100 GB of storage for all unmatched songs, so users can access rare or personal recordings across their devices. Music Hub also automatically updates playlists or music purchases music updated across all registered devices. A catalog of millions of songs for purchase AND streaming: Enjoy full access to 7digital’s entire Music Hub catalog, including music from all four major labels, to stream or purchase, with unlimited plays and no advertisements. Search for new music, create playlists, share songs with friends, and view lyrics and album information. Personalized and Custom Radio: Create personal stations based on favorite songs and artists, or browse genre stations recommended and custom-created by the Music Hub team. Users also can tag songs they like to find and play back later. Customized Recommendations: Discover great new songs, artists, albums and radio stations all the time – and the more users listen, the better Music Hub’s recommendations will get. Samsung, Music Hub, Galaxy and Galaxy S are all trademarks of Samsung Electronics Co., Ltd.
mSpot is a wholly owned subsidiary of Samsung Electronics Co., Ltd., which was formed in 2004 and acquired by Samsung in 2012. A provider of innovative music and video delivery service for mobile devices, the company has been offering white-labeled cloud entertainment services for mobile carriers such as AT&T, Sprint and Verizon. It also has its own brand services available in the Android Marketplace or App Store. For more information, go to www.mspotcorporate.com. 7digital is a leading digital content technology company based in London. Through 7digital’s download store (http://www.7digital.com) and mobile applications, consumers can access over 19 million legal high quality music tracks, as well as audiobooks and videos, at competitive prices across Europe, North America and beyond. Combining 7digital’s secure and robust technology platform with the broadest agreements in the digital media industry, the company provides comprehensive digital download and streaming services to a wide range of partners and brands around the world. 7digital’s enterprise level Application Programming Interface (API) is used by 300 partners globally, including Samsung’s Music Hub. If only Google+Samsung+HTC and many other companies besides Apple could collaborate and make their own ecosystem as one, it would be fantastc. I downloaded it yesterday, so far I'm not impressed. I know it's still early, but the interface is pretty bad. I created a station on the streaming radio and the song selection was TERRIBLE. Unless things take an unexpected up turn, I will be pretty dissapointed with music hub.